At Murphy and Son’s Plumbing, we use state of the art equipment to get your pipes back in working order quickly and with efficiency. High pressure water jetting is an environmentally safe, cost-effective and efficient way to clean drain pipes. It breaks up sludge and debris, and penetrates and emulsifies grease, leaving you with a clear, clean plumbing system. 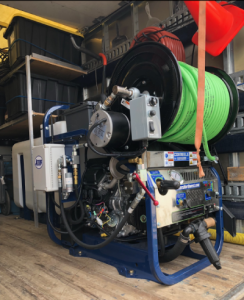 We use flexible hoses and high quality pumps through which we propel ordinary water in varying amounts of pressure until the clog is cleared. With this method, a special nozzle is mounted on the end of a strong hose that features several forward and reverse water jets. This creates streams of water that are both powerful and extremely concentrated, and these are directed through the pipes to clear even the toughest buildup. The blockage is unable to stand up to the high water pressure, and the result is thoroughly clean pipes. While a clogged drain might only seem like a minor inconvenience, any plumber can tell you that a clog is an issue that needs to be dealt with expediently. An unmitigated clog can ultimately lead to bigger problems with your plumbing, and additional expenses for you as a homeowner. We have plumbers in Laguna Niguel, Ladera Ranch and all of Orange County who have years of experience resolving clogged drains. They are qualified to perform the high pressure water jetting technique and other methods to clear your pipes, even if the clog is severe. Although very simple problems can be fixed without professional services, it is always a wise choice to consult with a plumbing professional to ensure that your plumbing is getting the maintenance that it needs to stay in good working order for as long as possible. In our time as plumbers in Orange County, we’ve talked to countless homeowners who have tried to use chemical drain cleaners to clear a clogged drain. While the store bought drain cleaners are relatively inexpensive, we urge property owners to use caution, as the long term effect of using these caustic chemicals can due irreversible harm to your pipes. Spending a few more dollars by hiring a plumber for clogged drains can end up saving you thousands of dollars down the line. By hiring a licensed plumber, you’ll ensure that your drains will be unclogged quickly and in a manner that will not harm your plumbing.